I personally bought one of these machines in about 1988 when they were being flogged off cheap at Dixons. I remember buying it from the Ashton-Under Lyne, Tameside branch and using it for college work with BBC basic and a Citizen 80 col colour dot matrix printer. I think I paid £200 for it! I bought almost everything I could for it. Every edition of the Einstein User magazine, the Speculator (Spectrum Emulator), a microswitched joystick, oodles of games and application discs, but I never had the colour/mono monitor! Foolishly I gave it all away because I had (at the time) outgrown it, or got bored with anything other than PC’s. Tatung Einstein – A ‘brief’ history – There is not really much available online about it’s life in the 80s! Early development of the Tatung Einstein took place at Tatung UK’s technical laboratory in Bradford (West Yorkshire) before production began at its factory in Telford. They produced a large, very well built, reasonably priced (for the specification) machine using the very popular Z80A processor running at an impressive 4MHz, supported by an equally impressive 80K of RAM, of which a generous 16K was devoted solely to the display. Outputs to TV and RGB were provided, along with standard serial and centronics printer ports, two joystick connectors and the “Tatung Pipe” which directly accessed the 8-Bit data bus. The Tatung Einstein was an 8-Bit home computer produced by the Taiwanese corporation Tatung. It was aimed primarily at the small busines market and was never marketed as a classic gaming machine. The system also included a built-in 3″ disk drive, with space for a second optional drive – a very impressive package built in a large case with a sunken top case for the monitor to stand in. It was more expensive than most of its rivals, and really lacked an obvious niche market other than technically advanced home programmers (it was suitable for people fluent in machine code and ‘binary load lifters’). 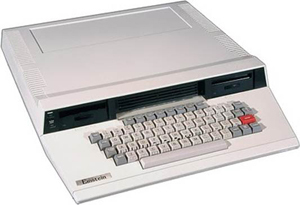 The Tatung Einstein TC-01 was released in the summer of 1984. It was unusual in that it entered a machine code monitor called “MOS” (Machine Operating System) on start up. A clever idea as a variety of software could then be run from disk including Xtal DOS (a CP/M compatible OS), XtalBASIC or even the excellent BBC BASIC which was available for the machine. Most 8-bit games were written on Einsteins then ported across to Spectrum Amstrads BBC. The irony is that these were used to develop software for the C64 and Sinclair!! There is a quote on another site speaking to the idea that at some time or other just about every game developer in the Northwest of England was using one of these to develop stuff for other computers, connecting up cables for the C64 and Amstrad, then readying software on those devices to make them receive the code as the target system. The Einstein contributed enormously to the UK game development industry.